This shrink tube kit provides an assortment of different color shrink tube to match your preference. Perfect for insulating all of your wire connecting jobs, the kit contains 105 total pieces cut in 6" lengths. Perfect for insulating all of your wire connecting jobs. 105 total pieces cut in 6" lengths. I.D. ranges 1/8"-3/4" in black, red, blue and yellow. Flame retardant single wall 2-1 polyolefin shrink tube, UL listed E-35586 and MIL-1-23053/5. All contained within a durable, lightweight, translucent carrying case (11" x 6-3/4" x 1-3/4"). This large shrink tube kit is the perfect match of function and form for post installation inspection of underlying components. 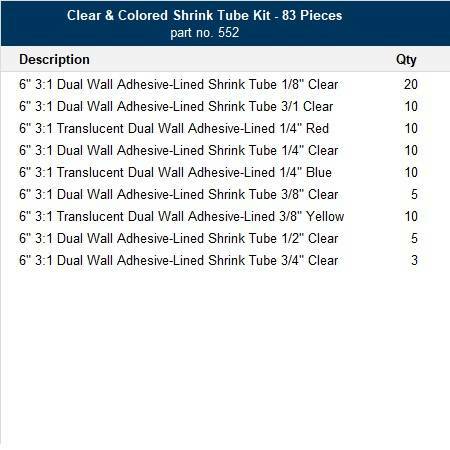 Inside the kit are 83 pieces of 10 different sized dual wall shrink tube in four different colors, including clear. The perfect match of function and form for post installation inspection of underlying components. 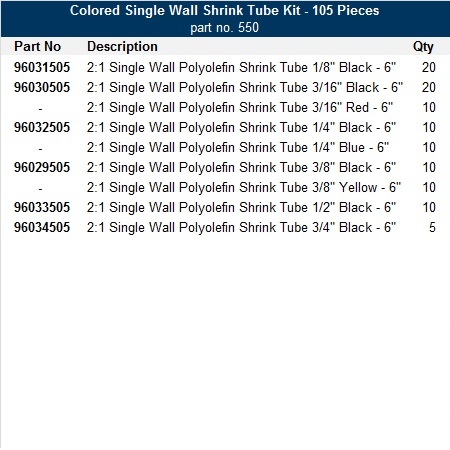 83 total pieces of 10 different sizes of adhesive-lined dual wall 3-1 polyolefin shrink tube in clear, red, blue and yellow. 6" cut lengths I.D. range for 1/8"-3/4"
UL listed E-157227, MIL-DTL-23053/4, Class1; AMS3534 (excluding clear shrink tube). Imprinted gauge size on translucent, color-coded shrink tube.